We consider optimizing the health and wellness of our employees – actively engaging them in their health – as part of our core responsibilities. Through our efforts to create and scale innovative programs that address all aspects of well-being – physical, mental, emotional and spiritual – we have helped our people thrive, and have raised the bar for employee wellness programs. An example of our ongoing passion for employee health and wellness is our HealthForce 2020 campaign. With its accompanying goals, the campaign focuses on helping our people work toward a “personal best” in health and well-being. We are cultivating an environment where our employees are eating better, moving more, and creating healthy habits to help everyone stay mentally focused and purpose-driven. In addition to Johnson & Johnson policies and programs, HealthForce 2020 deploys additional educational resources, digital tools, assessments, trainings, equipment and dedicated spaces, as well as support services to help our people make healthier choices and support those choices with healthier work environments. We are bolstering this work through global policies specific to Healthy Eating, Healthy Movement, Healthy Mind and Healthy Work; our aim is that by 2020, these policies will have been fully implemented across the globe. A big part of being healthy is moving more; this insight is the inspiration behind our 2017 Goal Getters and Create Your Own Challenges. Goal Getters was a global Challenge, executed through our HEALTHY & ME digital health app, designed to get our employees to be more active. 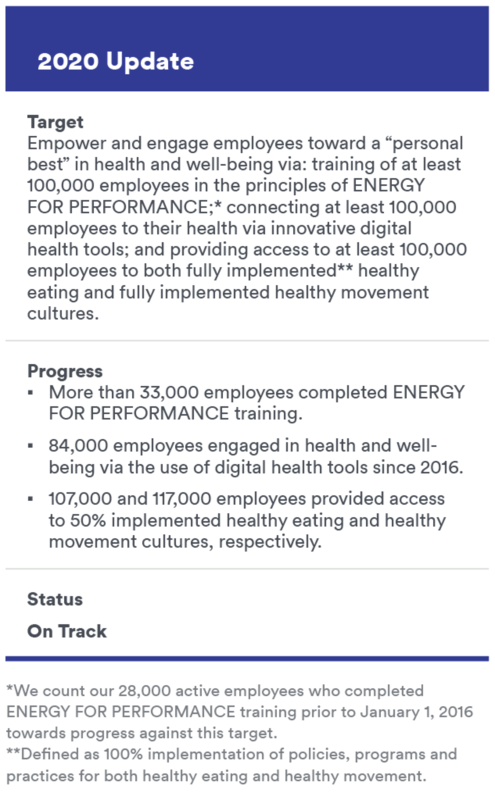 This unique, digital health application provides a suite of health and wellbeing apps, gamification and social networking, as well as links to resources, specific for Johnson & Johnson employees/spouses (allowing for choice, and customization for each user). Nearly 28,724 participants took on the Challenge, which tied in with employee engagement and support of the Johnson & Johnson commitment to the U.N. Sustainable Development Goals (SDGs), helping to raise approximately $75,000 for charities linked to our SDG commitment areas. Our employees got engaged with their health and marked an amazing 6.8 billion steps during the Goal Getters Challenge with a nearly 28% increase in activity. * We count our 28,000 active employees who completed ENERGY FOR PERFORMANCE training prior to January 1, 2016 towards progress against this target.